Singaporeans who don't go out much are often surprised by violent weather. To the point that NEA actually has to issue a statement that heavy showers are not uncommon in Singapore. But regular shore explorers know and respect stormy weather. When there's nothing between us and towering dark clouds building up high winds and megavolts of lighting, we learn to cower and flee for cover. Of all of them, the pre-dawn Sumatras are the scariest. As we reach the end of the morning super low tides, I'm glad to say this year we have not experienced the Sumatras too many times. Here's more about the Sumatras, weather that is unique to our region. Sumatras are lines of thunderstorms which usually occur between March and November each year. These squalls (lines of thunderstorms) develop at night over Sumatra or the Malacca Straits and move east towards Singapore and Peninsular Malaysia usually during the pre-dawn and early morning. They are often characterised by sudden onset of strong gusty surface winds and heavy rain lasting from 1 to 2 hours as they move across the island. Maximum gusts of up to 50 knots have been recorded during the passage of a Sumatra squall (Gusts are temporary rise in wind speed). In Peninsular Malaysia, squall-lines referred to as "Sumatras" are formed along the Straits of Malacca during the night and pre-dawn. Sumatras tend to move eastwards in the morning affecting mainly the west coast states of Peninsular Malaysia. Squall-lines in East Malaysia appear to exhibit the same characteristics, developing off-shore in the night before sweeping landwards in the morning. What happens when a squall-line approaches? When are squall-lines most likely ? Squall-lines usually occur during pre-dawn and early morning, and are most frequent between the months of April and November. However, squall-lines can occasionally form in the afternoons and move landwards along with the prevailing winds. The Sumatras is a phenomenon unique to the west coast of Peninsular Malaysia . Its formation is due to the location of the Indonesian island of Sumatra on the west, and Peninsular Malaysia on the east, separated by the narrow Straits of Malacca. During the Southwest Monsoon, southwesterly winds blowing over the mountain range of Sumatra creates mountain waves on the leeward side, resulting in an unstable atmosphere. Relatively warmer waters of the Malacca Straits provide a source of moisture for convective development. In a highly unstable atmosphere, thunderclouds grow in-situ and merge into line squalls. Squall-lines move northeastwards steered by the southwesterly wind towards the west coast areas of Peninsular Malaysia. Squall-lines indicate areas of extreme instability and severe turbulence. Embedded in squall-lines are thunderstorm cells, which can produce lightning, heavy rain leading to flash floods, and strong winds. In severe cases, they can cause injuries and loss of lives as well as damage to property. What to do in case of a storm? An approaching storm can be detected even in total darkness. The wind usually picks up speed (resulting in a distinctive sound in the rustling of trees), with a distinctive ozoney-humid smell. Regular explorers eventually know these signs which explains why they sometimes say "I don't like this wind". Once you feel rain and see lighting and hear thunder, it is usually too late. 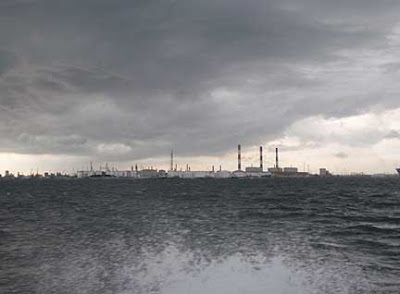 In daylight, on a flat large shore away from high cliffs or tall forests, approaching weather is obvious on the horizon. Dark clouds piled high in the sky is not good news. A continuous dark shade from cloud to horizon means rain is already falling in the distance. If you keep an eye on the horizon, the weather will not catch you by surprise. At the first sign of bad weather, get to shelter ASAP. On a mainland shore or large island, identify shelters to evacuate to BEFORE heading out to the shore. Do not wait under trees (especially coconut trees laden with nuts) or in odd pockets of the shores. Hiding under natural cliffs and in 'caves' within cliffs is not a good idea either in case of landslides. Most shelters in our public areas are equipped with lightning protection and are much safer. Stormy weather is particularly dangerous on offshore reefs involving amphibious landing as the dinghy usually cannot approach the shore. During storms, waves are high and it is even more dangerous to attempt a transfer. The best thing is to hunker down and hope the storm passes BEFORE the tide rises. Scary. 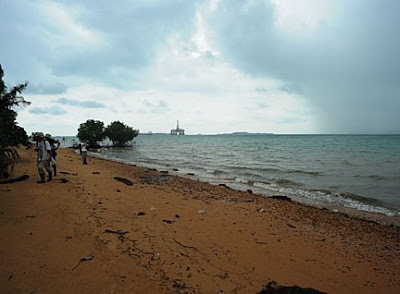 Update, Jun 10: The Sumatras as well as other weather effects such as El Nina are attributed as the cause of the flooding in Singapore in Jun 2010. See media reports.